the Most Excellent Order of the British Empire (OBE) by Queen Elizabeth II in the 2013 New Year Honours for services to business. 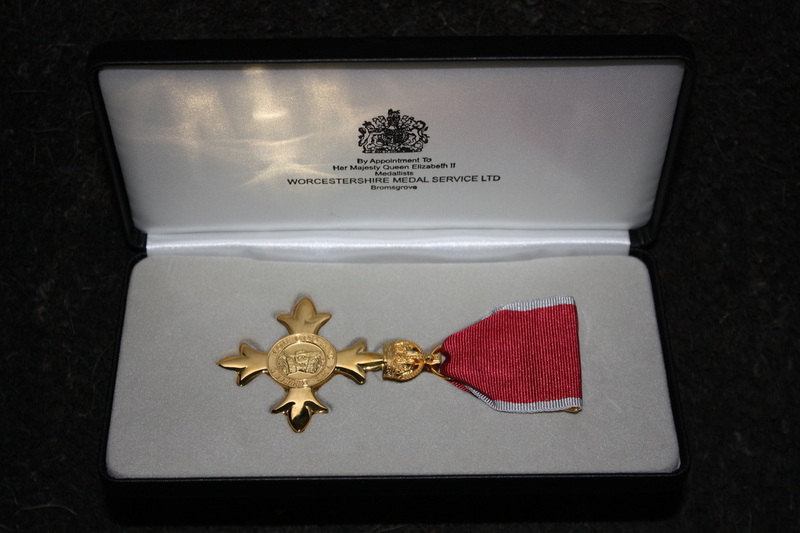 The OBE medal in the case it is placed in after the Queen has presented the medal. 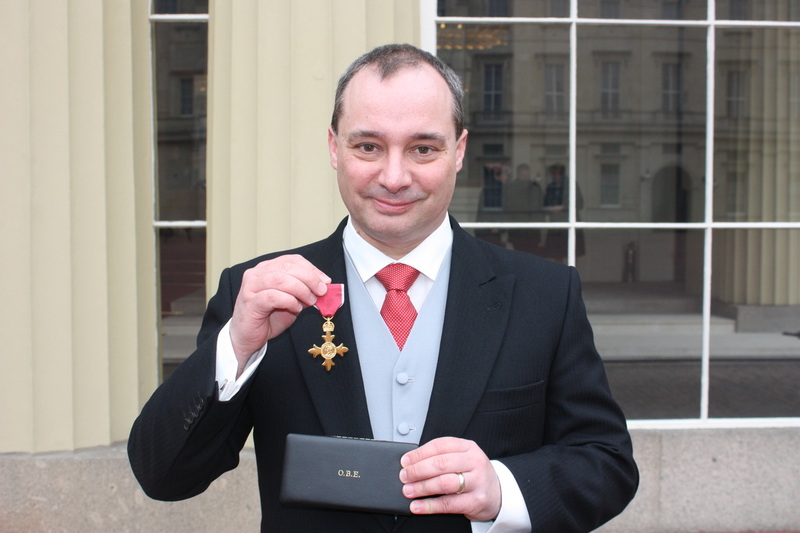 Professor Richard Wilding OBE outside Buckingham Palace after the Investiture on the 26th March 2013. 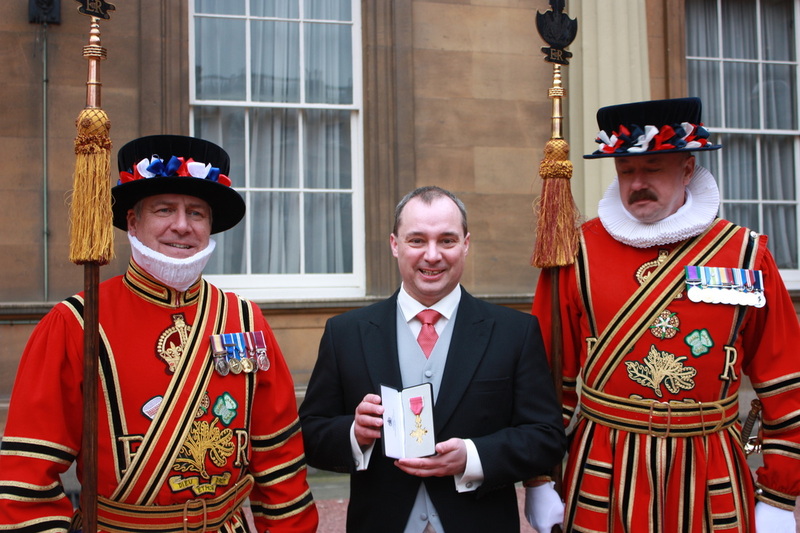 Professor Richard Wilding OBE outside Buckingham Palace with members of the Queen's body guard. After the medal is placed and a short discussion the recipient shakes hands, walks backwards and bows before leaving the Queen's company. The OBE medal on its case. 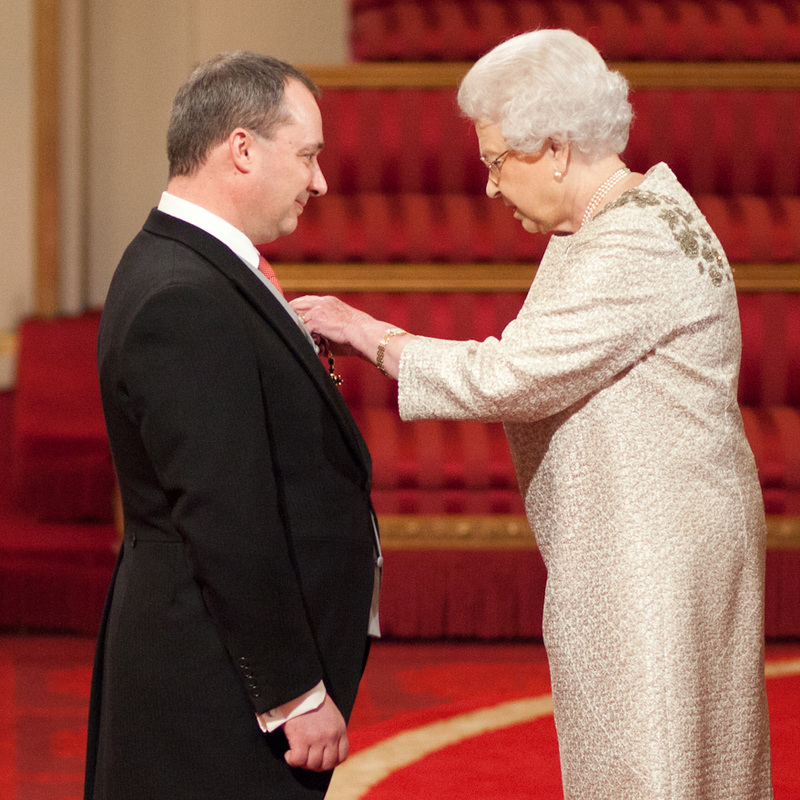 Professor Richard Wilding at his investiture at Buckingham Palace. 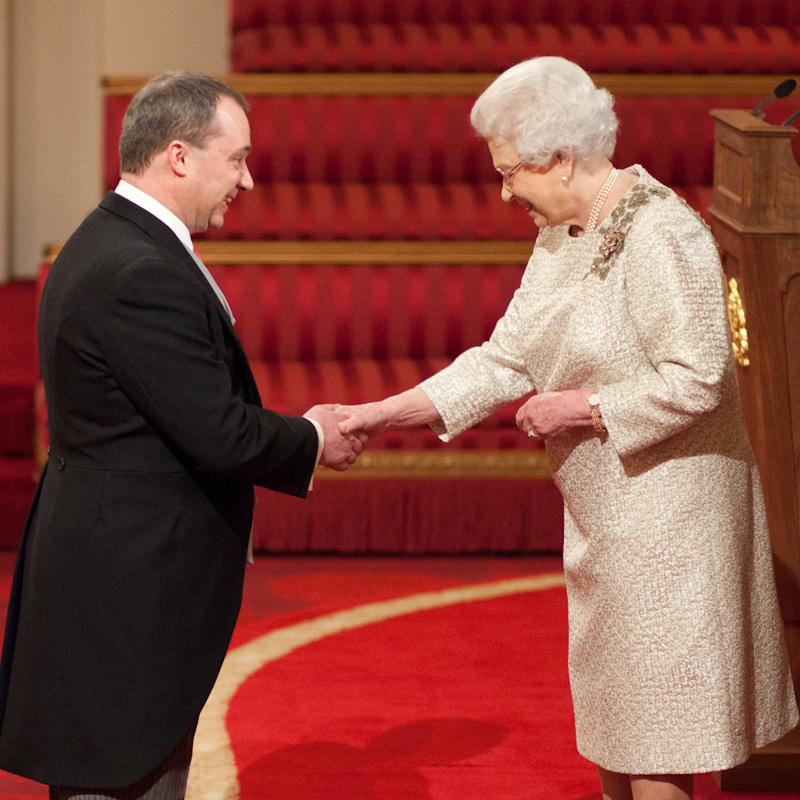 Professor Richard Wilding was requested to attend an investiture at Buckingham Palace on Tuesday 26th March 2013. He received his honour in person from The Queen. Others being honoured on that day included Stella McCartney (Fashion Designer), Victoria Pendelton (Olympic Cyclist) & Flight Lieutenant Gerald Wyatt (War Hero). The investiture started promptly at 11am and lasted about one hour. After the ceremony guests and recipients were able to spend time taking photographs and socialising. It is a very special day for all. The Most Excellent Order of the British Empire – BEM, MBE, OBE, CBE, KBE or DBE. The “Most Excellent Order of the British Empire” is an order of chivalry, awarded by The Sovereign, on the advice of the United Kingdom Government. Its motto is “For God and the Empire”. There are strict limits on the number of appointments each year. U.K. Queen's Honours recognise exceptional service and/or exceptional achievement. It can be awarded to British Nationals or anyone who makes an impact for the United Kingdom. It recognises people of outstanding merit and distinction, and those who have committed themselves to service to the nation. The levels of award in order of seniority are: British Empire Medal (BEM), Member (MBE), Officer (OBE), Commander (CBE) and Knight or Dame (KBE or DBE). Personalities and celebrities who have been honoured and appointed OBE (Officer of the Most Excellent Order of the British Empire) in recent years include: David Beckham (Footballer), Kylie Minogue (Singer), Gary Barlow (singer), Darren Clarke (Golfer), Jamie Oliver (T.V. Chef), Sarah Burton (Designer of the Duchess of Cambridge wedding gown), Jonathan Ross (U.K T.V. celebrity) & Pierce Brosnan (007 Actor). Famously the “Beatles” were appointed MBE (Members of the Order of the British Empire) in 1965. The list of honours is published in the United Kingdom twice a year at the New Year and also the date of the Sovereigns (official) Birthday. They are first published in the London Gazette, the official Crown Newspaper before circulation to the general media. After the list is published the individual is invited to an investiture. The investiture is the ceremony when the individual who has been awarded an honour receives their award in person from The Queen, The Prince of Wales or occasionally The Princess Royal. The majority of investitures take place in the Ballroom at Buckingham Palace.